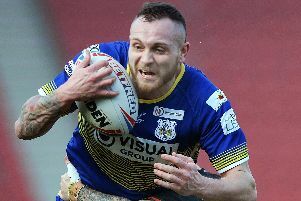 Winger Richie Barnett says Doncaster’s Super League friendly double bill with Leeds Rhinos and Hull FC will be a good gauge ahead of the new League One season. The Dons, who beat Sheffield Eagles in the South Yorkshire Cup last weekend, welcome Leeds to the Keepmoat tomorrow (3pm) and dual registration partners Hull the following week. “The next two games will be bigger tests for us but it will be good for us to push ourselves,” said Barnett. Barnett, 35, made a try-scoring debut in the 22-18 victory over Sheffield, a game which saw eight new players make their first appearance for the Dons. “It’s always good to get a try early on when you’ve just joined a new team. On my first game at the Keepmoat I couldn’t really have asked for a better start,” he said. He added: “We’ve worked hard during pre-season, all the boys are feeling fit and strong and hopefully there’s better to come. Stevie Ward, Brett Delaney, Ash Handley and Jordan Lilley could all feature for Leeds this weekend. Tickets for the game are priced £10 adults, £8 concessions and £2 juniors. The Dons begin their League One campaign at home to Coventry on March 5.